Heel pain is a symptom, not a disease. In other words, heel pain is a warning sign that a child has a condition that deserves attention. Pediatric heel pain differs from the most common form of heel pain experienced by adults (plantar fasciitis) in the way pain occurs. Plantar fascia pain is intense when getting out of bed in the morning or after sitting for long periods, and then it subsides after walking around a bit. Pediatric heel pain usually doesn't improve in this manner. In fact, walking around typically makes the pain worse. Heel pain is so common in children because of the very nature of their growing feet. In children, the heel bone (the calcaneus) is not yet fully developed until age 14 or older. Until then, new bone is forming at the growth plate (the apophysis), a weak area located at the back of the heel. Too much stress on the growth plate is the most common cause of pediatric heel pain. There are a number of possible causes for a child's heel pain. Because diagnosis can be challenging, a foot and ankle surgeon is best qualified to determine the underlying cause of the pain and develop an effective treatment plan. Calcaneal apophysitis. Also known as Sever's disease, this is the most common cause of heel pain in children. Although not a true "disease," it is an inflammation of the heel's growth plate due to muscle strain and repetitive stress, especially in those who are active or obese. This condition usually causes pain and tenderness in the back and bottom of the heel when walking, and the heel is painful when touched. It can occur in one or both feet. 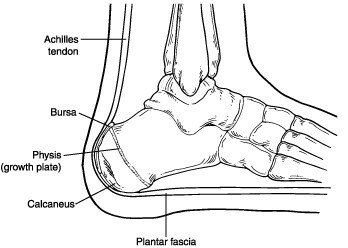 Tendo-Achilles bursitis. This condition is an inflammation of the fluid-filled sac (bursa) located between the Achilles tendon (heel cord) and the heel bone. Tendo-Achilles bursitis can result from injuries to the heel, certain diseases (such as juvenile rheumatoid arthritis), or wearing poorly cushioned shoes. Overuse syndromes. Because the heel's growth plate is sensitive to repeated running and pounding on hard surfaces, pediatric heel pain often reflects overuse. Children and adolescents involved in soccer, track, or basketball are especially vulnerable. One common overuse syndrome is Achilles tendonitis. This inflammation of the tendon usually occurs in children over the age of 14. Another overuse syndrome is plantar fasciitis, which is an inflammation of the band of tissue (the plantar fascia) that runs along the bottom of the foot from the heel to the toes. Fractures. Sometimes heel pain is caused by a break in the bone. Stress fractures—hairline breaks resulting from repeated stress on the bone—often occur in adolescents engaged in athletics, especially when the intensity of training suddenly changes. In children under age of 10, another type of break—acute fractures—can result from simply jumping 2 or 3 feet from a couch or stairway. To diagnose the underlying cause of your child's heel pain, the foot and ankle surgeon will first obtain a thorough medical history and ask questions about recent activities. The surgeon will also examine the child's foot and leg. X-rays are often used to evaluate the condition, and in some cases the surgeon will order a bone scan, a magnetic resonance imaging (MRI) study, or a computerized tomography (CT or CAT) scan. Laboratory testing may also be ordered to help diagnose other less prevalent causes of pediatric heel pain. Cushion the heel. Temporary shoe inserts are useful in softening the impact on the heel when walking, running, and standing. Orthotic devices. Custom orthotic devices prescribed by the foot and ankle surgeon help support the foot properly. Immobilization. Some patients need to use crutches to avoid all weight-bearing on the affected foot for a while. In some severe cases of pediatric heel pain, the child may be placed in a cast to promote healing while keeping the foot and ankle totally immobile. Follow-up measures. After immobilization or casting, follow-up care often includes use of custom orthotic devices, physical therapy, or strapping. Surgery. There are some instances when surgery may be required to lengthen the tendon or correct other problems. Often heel pain in children returns after it has been treated because the heel bone is still growing. Recurrence of heel pain may be a sign of the initially diagnosed condition, or it may indicate a different problem. If your child has a repeat bout of heel pain, be sure to make an appointment with your foot and ankle surgeon.